The St. Johns River boasts some of the most scenic river views, impressive wildlife sightings and best fishing spots in the state of Florida. Whether you are a nature lover looking to uncover the secrets of Central Florida’s ecological corridor or a fishing enthusiast wanting to tackle one of the most famous fishing destinations in the world, Tropical Resort and Marina has a Florida boat rental that will suit your needs. One of the most important factors of renting a boat in Florida (perhaps the most important factor) is where your Florida boat rental will take off. If you’re looking to score a fishing boat rental, you’ll want to make sure that the destination you choose to take off from is a prime fishing location with lots of navigable options to cruise to in order to snag a variety of great catches. You’ll want to depart from the heart of Florida’s great river, so that all the best fishing locations can be explored during a day out on the water. Luckily, the dock off of Tropical Resort and Marina’s property is the perfect take off point for your Florida fishing boat rental. You can start in beautiful Lake Beresford and cruise through to the core of the St. Johns River. You’ll even have time to take your Florida fishing boat rental right up to Lake George for some bass fishing if you so desire. The options are endless, but one thing is for sure: you and your fishing companions will have a fantastic adventure that will take you to some of the best fishing spots the St. Johns has to offer, all in one day. A fishing boat rental might not be the best option for your Florida outing. Perhaps you just want to rent a boat for a leisurely Florida day out on the water with friends. Maybe you’d like to get up close and personal with Florida’s many environmental wonders on the river. If you’re looking for a Florida boat rental to do some relaxing, picnicking, ecological exploration, bird watching, or in-depth wildlife photography, Tropical Resort and Marina has a vessel for you that is easy to navigate as well as easy on the surrounding wildlife. A suited up fishing boat rental or high-speed motorized boat could hinder your relaxed mood or scare away some of the wildlife in your path. Fortunately Tropical Resort and Marina offers a variety of boats, including quiet, slow and steady pontoon boat rentals: perfect for a wildlife excursion or a day eating and drinking with family and friends on the water. No matter what type of excursion you’re looking to achieve, considering the type of Florida boat rental to pick is a must in order to achieve the perfect outing. Our fishing boat rental options include 14’ fishing boats with electronic start motors for just $55.00 for a full day and $40.00 for a half day. Our other Florida boat rental options include plenty of pontoon boats to choose from, such as our 18’ deluxe pontoon rental for just $165 for a full day on the water! For bigger groups, we’ve got a 24’ pontoon boat for just $225 for a full day. Five gallons of fuel is included with all our pontoon rentals, plus all the life jackets and safety equipment you’ll need. Explore our website to learn more about our Florida boat rental options. Whether you are in search of a fishing boat rental, pontoon boat rental or even a kayak rental, Tropical Resort and Marina has a boat for you. 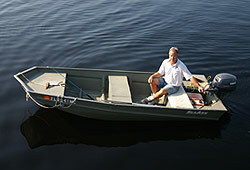 View our fishing boat rentals.